I thought it is going to be a quick task, turned out, I started writing this MP about 1 month ago and only able to release it now! 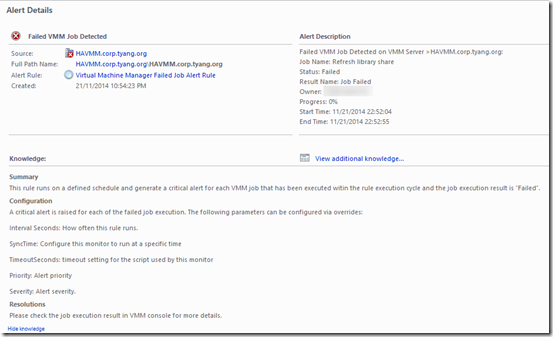 The actual MP is pretty simple, 2 rules sharing a same data source which executes a PowerShell script to detect any failed and warning jobs in VMM. I wrote the initial version in few hours and sent it to Flemming and Steve Beaumont to test in their environments right before the MVP Summit. After the summit, we found out the MP didn’t work in their clustered VMM environments. We then spent a lot of time emailing back and forth trying to figure out what the issue was. 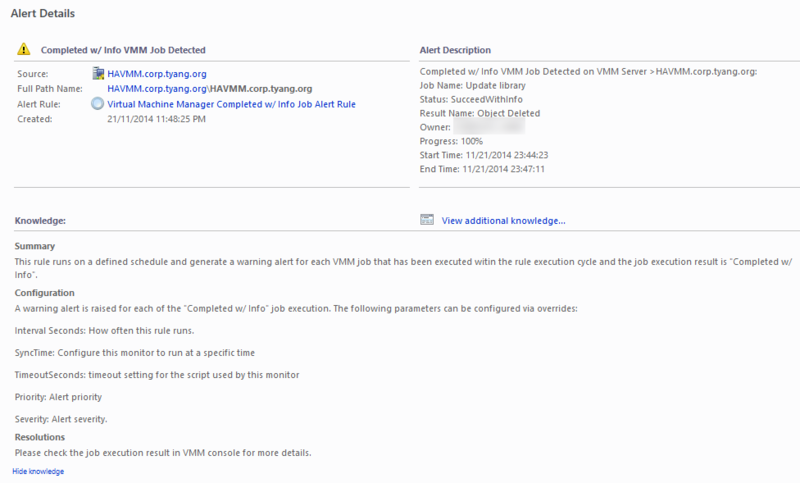 In the end, I had to build a VMM cluster in my lab in order to test and troubleshoot it . So, BIG BIG “Thank You” to both Flemming and Steve for their time and effort on this MP. It is certainly a team effort! 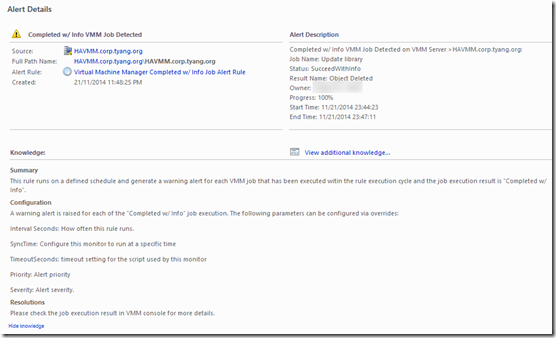 PowerShell script execution must be allowed on VMM servers and the VMM PowerShell module must be installed on the VMM server (It should by default). 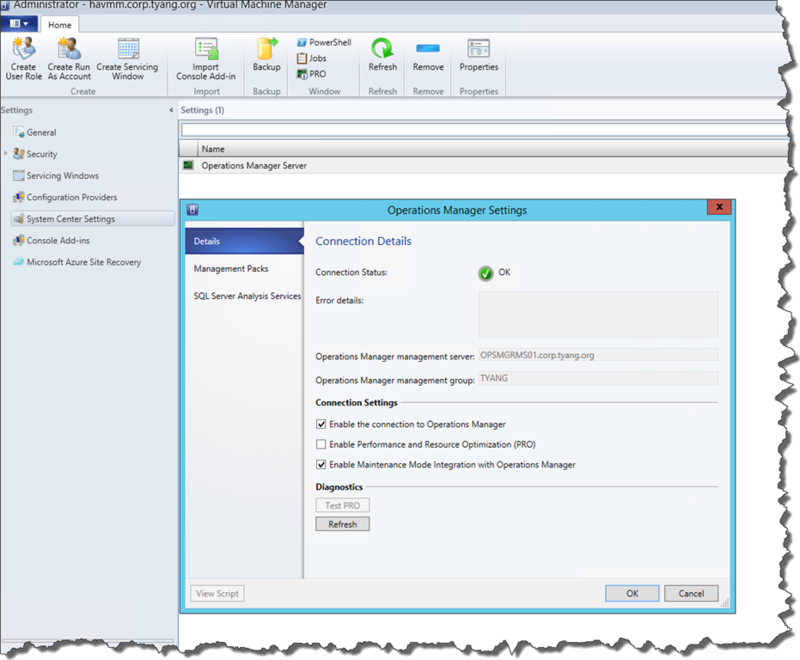 The VMM server must be fully integrated with OpsMgr (configure via VMM console). 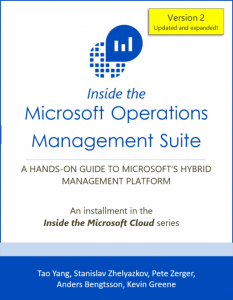 This integration is required because this integration creates RunAs account to run workflows in native VMM management pack. 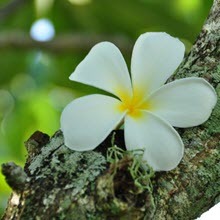 This Addendum management pack also utilise this RunAs account. 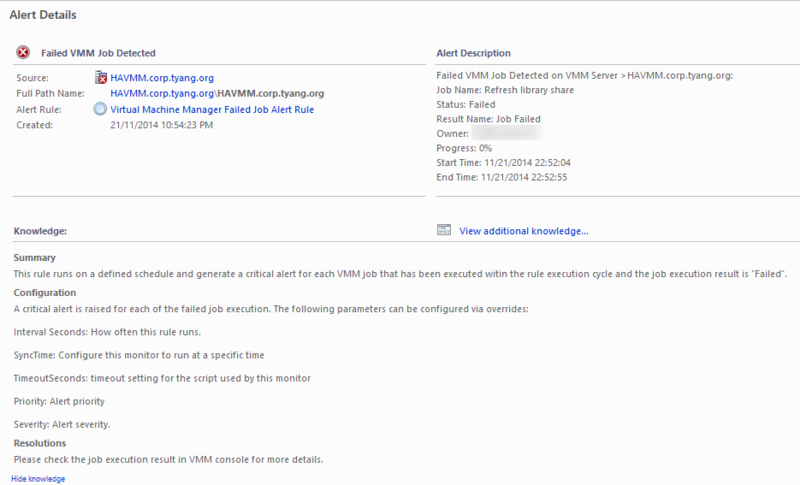 Note: Please keep in mind, If you enable the “Completed w/ Info job alert rule”, because we utilise Cook Down in these 2 rules, if you need to override the data source configuration parameters (IntervalSeconds, SyncTime, TimeoutSeconds), please override BOTH rules and assign same values to them so the script in the data source module only need to run once in every cycle and feed the output to both workflows. Since it’s a really simple MP, I didn’t bother to write a proper documentation for this, it’s really straight forward, I think I have already provided enough information in this blog post. Please test and tune it according to your requirements before implementing it in your production environments. Lastly, I’d like to thank Steve and Flemming again for their time and effort on this MP. If you have any questions in regards to this MP, please feel free to send me an email. it seems this is not working in my case, I too have clustered environment and after importing this MP, I could not see any alert getting generated in SCOM Console of failed or competed/w jobs of my SCVMM. 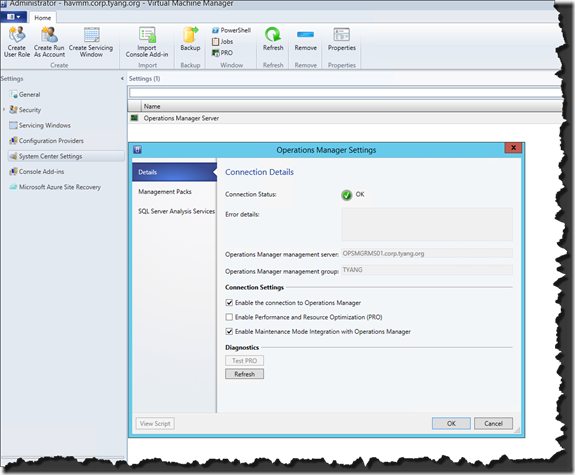 Do I have to do any further configuration after importing the MP into SCOM? I’m using System Center 2012R2 All components. Is there any way to notify VM provisioning status via e-mail when a VM is provisioned through WAP Tenant portal? E.g. If a VM is provisioning through WAP Tenant portal in ANY SCVMM Cloud, one e-mail notification should be sent to the creator “Status-Provisioning” and once it is provisioned “Status-Provisioned” including all the VM details? I’m sure it is not possible out of the box, however if anyone can help to share any PowerShell scripts or something? so I can modify and use it as per my requirement.